Karina's Kreations: More Grunge Rock! This is the second card from my Grunge Rock class. I started with an Old Olive card stock base and stamped the crown image using Old Olive classic ink. The Pretty in Pink card stock was stamp with Pretty in Pink classic ink and Regal Rose classic ink. 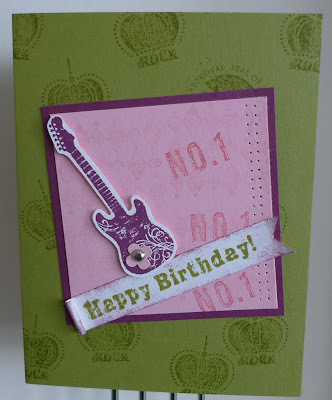 The paper piercing tool and Mat pack was used to poke two rows of holes on the Pretty in Pink card stock which was layered onto Rich Razzleberry. The guitar was stamped with Rich Razzleberry ink on Whisper White card stock and cut out with paper snips. The flower was punched out with the Itty Bitty Shapes punch pack. I love these punches!!!! A silver brad attached the flower to the guitar. Happy Birthday was stamped on Whisper White card stock and one end was curled and the other was snipped with scissors. Rich Razzleberry ink was sponged on the edges.